What’s on YOUR #Christmas Card? – Imagine Classic Literary Characters living in the Modern World. Read Jane Eyre Gets Real, a Novel by Annabelle Troy, available on Amazon! What’s on YOUR #Christmas Card? Mild-mannered David Copperfield, featured in Jane Eyre Gets Real, was originally created by Charles Dickens, aka “the man who invented Christmas”. 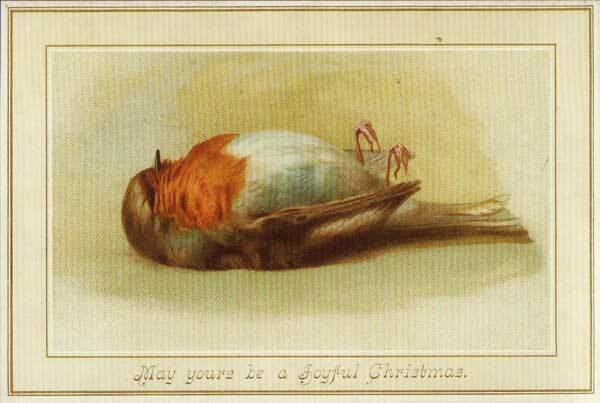 That may well be–but he didn’t invent the Christmas card. That honor goes to Henry Cole, credited with sending out the first card in 1843. It featured a controversial image–of children, along with adults, imbibing spirits–and it was sent for just one cent via the new “Penny Post”. Victorians may not have been fans of drunken children but they did love a good picture. As the century evolved so did two popular motifs: dead birds and killer frogs. Though robins with rigor mortis and frogs brandishing swords may not do much for the modern eye, the 19th-century person would have instinctively connected with these images. Sacrificed birds were seen as symbols of Christ on the cross–in fact, on December 26, wrens and robins were ritualistically killed (in a kind of reverse crucifixion) in some remote country villages for good luck. Murdering frogs were “dead ringers” for Judas, the apostle who betrayed Jesus. Meanwhile, you just might want to stick with cherubs, reindeer or a nice Norman Rockwell.